Seen those hair strands caught in between the bristles of your brush? Maybe you’ve noticed a thinning patch of hair while styling or freshening up by the mirror? While not exactly life-threatening, hair fall may cause stress and damage to your emotional and psychological well-being. Imagine the embarrassment that in a social setting someone points out a noticeable cluster of hair strands on your shoulder; or that a friend makes a joke about how your patch of thinning hair is a sign of aging. As what most hair experts would say, hair fall and hair loss is mostly out of your control. It comes as a result of different conditions and causes, including genes and the very natural process of aging. 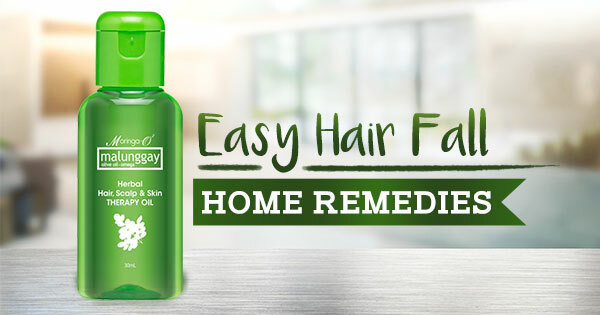 Yes, hair fall is mostly out of your control, but don’t worry, because there are these easy hair fall home fixes that you can do. – Create green tea solution by dipping and soaking 2 green tea bags into a hot cup of water. Wait until the solution cools. – Use the solution as an after-shampoo rinse. – Break 2 eggs and separate yolks from egg whites. – Stir and beat the egg whites until it reaches a thick and even consistency. – Apply the mask on your scalp and hair with a brush. – Cover your head with a shower cap and leave for 20 minutes before washing. Keeping your scalp and mane healthy by eating well and using the right products works too! Try the Moringa-O² hair care system for the best of what Malunggay, Olive Oil and Sunflower Oil has to offer.